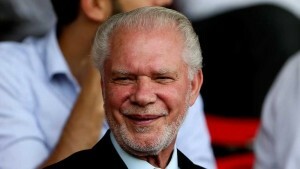 Speaking to www.whufc.com he said: “I am always excited by the beginning of the season and this is no different. It could not be more difficult than going to Arsenal but I think we are ready. I am confident we are going to have an exciting season. “Arsenal are a top four football club and have been so for many years, We are getting closer and closer and they will be looking over their shoulders. Our ambition is to make the top four worried. With us moving to the new Stadium I am sure that is going to be the case. “We have got a fantastic fan base and that is the key. The numbers have been proven and we had 100,000 fans coming to see the Europa League Qualifiers and that is unheard of. At full strength we can be a match for most this season, all this bollox that we are going to struggle & might even get relegated.. not chance.. I said the same thing a week ago about ” worrying ” the elite . We can get over confident , but certainly this is our biggest chance to upset the odds a bit. Just had a laugh listening to the TV Sky Pundits ,,, none of them said West Ham will have a good season … Their collective opinion was , in general : West Ham will finish below mid-table and or be fighting against relegation …. I am going to love stuffing their own words up their arses . They have started spouting off already ,, unbelievable . We need another goal scorers, we only really have Sakho who could be prolific. Can’t for the life of me understand why we haven’t just gone and bought Austin. Get that position covered and no way we anywhere near relegation fodder!! So wish Gold would stop always bigging us up then doing sod all in the market to actually back up his statements.The geezer is delusional!! Im confident we will have a comfortable season but his constant talk of the big four or top six & us ruffling their feathers is utter bollox. Although I respect our owners and think they have our best interests at heart I also think they lack class when it comes to Press Statements, P.R. Social Media etc. What the fuk did you think Gold would be saying? “I know we aren’t anywhere near the top six so hopefully we can scrape a top half finish. We are aiming to make Swansea, Stoke etc look over their shoulders ” West Ham are his team & wants to take them up to that level, he will be bigging us up. Yes we do need a new striker & i’m thinking that things will prob be happening behind the scenes. Bet they probably b*ll****ted Payet to get him to sign.Probably told him we were going to spend a load more cash.We shouldnt expect too much from G&S,they always talk sh*t about transfer windows.Watch Newcastle,Stoke,Palace all out spend us.Then this geezer will wonder why they finish above us.They have done some good stuff,but when it comes to transfer windows they are are mickey mouse. On the money chicken.I’m also sick of the bullsh*t that Gold says at times. All this predicting is OK but man city came up trumps because they bought success,same as Chelsea! Do we really want this or staying in the top ten? ?big teams, big money, big wages in other words”””MONEY, stay as you are west ham perhaps a little improvement ******** to the top crap! How can you close the bloody gap when their lead has increased?What have they spent and what have we?